Conversational Case Study: Myth or Fact - Can Small Nonprofits Win with Social Media? Almost a year ago, Allison Fine and I finished a reflection paper on the lessons learned from the first America's Giving Challenge from the Case Foundation. This year, we are experimenting with incorporating social media techniques as part of the evaluation process for the second America’s Giving Challenge. While we've used traditional research methods, including a survey of 720 Challenge Participants and interviews, we are facilitating “Conversational Case Studies” that explore best practices in integrating social media with fundraising campaigns by the America’s Giving Challenge (AGC) winners. A conversational case study is a write up our interviews identifying a few questions we still have. The first case study explores how a small organization, Darius Goes West, was successful in AGC. We wanted to begin with a small group because one finding from the survey of participants was that people still think that being a small organization is a disadvantage to using social media successfully. Our detailed case study with Darius Goes West reveals some fantastic insights and learnings. Whether your participating in an online contest or implementing a fundraising campaign using social networks, you’ve got to engage your fans and make it easy for them to share your organization’s story with pride and joy. What techniques are you using? How have you used social media to personalize your interactions with potential supporters? Does it work? 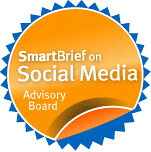 If you are with a small organization, how have you used social media successfully without a big marketing budget? How can we put to rest the assumption that large organizations have an automatic advantage using social media? So, go join the conversation in the comments over at the Case Foundation blog. The top 100 "eligible" vote getters were announced in December. Each organization received $25,000 and the announcement caused some controversy because of the contest eligibility rules and lack of a leaderboard. The second round of the contest opened on January 15th and the pre-contest promotion on January 14th on the contest fan page was met with a chorus of "Vote for Haiti." Chase had, in face, already donated to the relief efforts, although the link to the corporate press release was not posted on the Fan Page all until two days later. The 100 organizations are now participating in the next round, "The Big Idea" where the 100 charities share their big idea for changing the world and get votes. The winner gets $1 million and five finalists will receive $100,000 each. The top 100 included a mix of nonprofits with an operating budget of under $10 million with programs in designated Chase corporate responsibility areas: education, health care, housing, the environment, combating hunger, arts and culture, human services and animal welfare. Over the holidays and into early January, the Chase Community Giving contest quietly implemented a leader board, a scoreboard showing who is winning based on the number of votes. In other contests, the leaderboard has been updated in real time. Unlike standard practice for other contests, this leader board is updated twice a day. Having real-time information is very important to the organizations. It helps them motivate supporters to vote as well as helps organizations make real-time adjustments to their strategy. Real time leaderboards make the contest very transparent. Nonetheless, you can still click through to each group's project page to see the real-time vote tally and I'm sure all 100 organizations are monitoring how others are doing to get out the vote. The platform initially had some technical problems where the voting pages and leaderboard landing pages did not load quickly or at all. This may be due to heavy voting traffic or whatever, but contest organizations came up with creative workarounds. For example. Friendship Circle, has a web contest landing page that provides instructions on how to vote and a direct link to the Facebook app page. Some are some quick observations about the strategies the organizations are using as the contest unfolds. As Farra Trompeter points out in a post about the contest, it is important to explain the big idea in a few sentences. As I looked up and down the leaderboard, I noticed that Idealist was in the top 15. Their proposal for "changing the world" is something they've been working on and getting feedback on for the past two years. The executive director, Ami Dar, has been a thought leader the nonprofit technology sector for many years. Because I know their work first-hand, they got my vote! In watching the scoreboard, the first and second place contenders have been fluid. Invisible Children had a dramatic lead in the last two days, but was over taken by Twloha which as of this writing had a lead of 10,000 votes or approximately 37,000 votes or roughly 10% of its Facebook fans. But this isn't about size of a charity's fan page as you can see by looking at the third place contender, Bridge to Turkiye, with almost 20,000 votes and a fan page base of 4,000. There is also the importance of offline/online connection that can't be ignored. For example, Friendship Circle, had a rallied at a Piston's Game in Detroit (see above video) and organized 3,000 teens to play freeze tag on Facebook to rally the vote. The Center for the Pacific Asian Family (CPAF) was around 50th on the leaderboard on Saturday and is now a respective #15 with a small but committed fan base of 600 people on Facebook. The organization made it into the top 100 because passionate and well connected supporter, Teddy Zee, decided to be their champion. He is organized parties to get hundreds of people to vote and connect through chats to get their friends to vote during the voting week. According to Deborah Suh, executive director, "Whether we win the next round (we get $100,000 or $1 million), this has been a great way to raise our social networking presence." Good luck to all the organizations participating in the contest. Here's where you can go vote! What strategy advice would you offer to the 100 organizations competing in this contest? My son, Harry, who some of you have watched grow up on this blog celebrated his 10th Birthday! It seems like just yesterday when Harry's tooth was loose and Wanna, a Cambodian blogger, taught us about the Cambodian tooth fairy. As we were singing happy birthday, I realized that Harry is growing up with having social networks and generosity in his life. This is not limited to external trends, but we're trying to model philanthropic behavior in this house. He has watched his mother celebrate her birthday and use it as an excuse to raise money for the Sharing Foundation, a charity that cares for kids in Cambodia. He's too young to set up a birthday campaign on Facebook Causes and asked me to donate $10 to the Sharing Foundation. He hopes that you too will consider donating $10 to the Sharing Foundation in honor of his birthday. 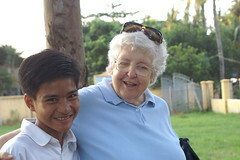 The Sharing Foundation's core volunteers are, like me, parents of adopted children from Cambodia. And, like our family, they want to encourage their children to give back to Cambodia. Whether it is cash donations or in-kind contributions, part of the holiday season, as a birthdway wish or just because it is important for us to support work that takes care of children in his birth country. Harry is not the only Cambodian adoptee who supports the Sharing Foundation. Kanaha S, also adopted from Cambodia, asked her guests to donate new underwear for Roteang Orphanage children in lieu of gifts at her 8th birthday! This year, I'm sitting out the America's Giving Challenge, but this group volunteers, parents of Cambodian adopted children, and board members took the plunge into Facebook. I'm doing a little coaching from the sidelines. They don't expect to win the grand prize, but have doubled the number of people and dollars in the TSF Facebook Cause! So make a donation of $10 or more between before the Challenge ends on November 7th, help Harry's birthday wish come true. You can contribute to the Sharing Foundation here. I'd like to dissect the format and share a bit of the content. I think this format could be easily be used by many nonprofits, even those who share policy research. There were some terrific questions asked, and while I took a stab at the answers, hoping sharing the questions might inspire a few guest blog posts. The sessions used an hour long talk show format with Case Foundation's Kari Dunn Saratovsky as the host. The tool was a live streaming platform called Ustream.tv that lets anyone with an inexpensive web camera and internet connection to broadcast to the world. Ustream provides a live streaming video window, an archive of the video, the ability for the audience to log into the chat room and ask questions and a social stream. Live streamed talk shows have been used quite artfully by social media experts over the years. Chris Pirillo comes to mind. I remember my colleague, Jonny Goldstein, launched his show in the fall of 2007 and gave a terrific talk about live streaming technology and web talk shows at Podcamp Boston in 2007. Engaging the audience is a very important to the success of this genre. This requires giving your audience plenty of opportunities to ask questions prior to and during the event. For this series, there was a guest post on the blog and a request for people to ask questions via Twitter, Facebook, or email. Kari came to my house a half hour before the interview went live. She booted up her laptop, plugged into my Internet connection, and set up her Webcam. She has a list of questions that had already come in via email and started with those questions. During the hour, she asked questions, I answered. A simple conversation, except that we a couple of hundred of other people were following along in the chat room, Twitter, and Facebook. As new questions came in through the Ustream chatroom, Kari would select them as follow up questions. While Kari was sitting next to me in my home office, her colleagues Kristin Ivie and Sokunthea Sa Chhabra were in the chat room engaging with the audience, watching the "social stream" (comments from Twitter and the chat) and forwarding questions to Kari to ask live via AIM. After the interview an archived copy of the video was uploaded into Youtube and an after the interview blog post. I was a little nervous that an hour-long talking head interview might be boring. 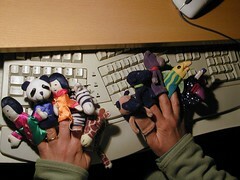 I brought a couple of props to make it fun and more interactive, including my finger puppets. I used them to answer some of the questions and to make a few points. Is your organization ready to be a learning organization? That is value "mistakes" as opportunities to learn and improve what you're doing? Does your leadership understand the potential value and is willing to invest in low risk experimentation? Can you articulate a clear set of "starter goals" that might incorporate learning? Can you shape and identify a beginner starter project (s) that doesn't take too much time? Are you ready to engage and build relationships with your stakeholders? Here's a list of the questions that were asked and link to the spot in the video where I answer it. If you have follow up questions or want to share your answers to these questions. Leave me a comment! Better yet, if you'd like to write a guest post answering the question, leave a comment too. How do you balance cross generational voices within your organization, and who should own the soc media? What should orgs ask themselves before diving into soc media? We dove into social media without listening, how do we regroup? Does reverse mentoring actually work? Should we invite our entire mailing list to follow us on Twitter? How do we tie all our varying soc media outlets together? If people aren’t participating in the discussion on your org, are you not reaching your audience? Should nonprofits ask facebook users to join causes, join fan pages or both? Where can I find demographic data on different soc media venues? Why are nonprofits always playing catch up with soc media? Should we track our Twitter followers and Facebook friends to gather info for fundraising? Should soc media always drive people back to your website? What applications should you use for tracking links? How do we measure the effectiveness of our soc media efforts? 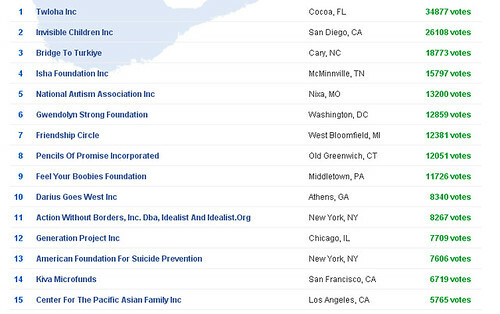 How important is it for nonprofits to monitor their brand? How important is it to have policies and guidelines within your org for soc media? What are some suggestions for online fundraising strategies? What is the future for social media in the nonprofit world? Note from Beth: Michael Hoffman wrote a fantastic guest post over the summer about viral video strategies for nonprofits. So, invited to guest post again. Next week, Michael Hoffman will be participating in the WeAreMedia Webinar - you can take a deep dive with him about storytelling in video and get your questions answered. But, that's not all, we'll have a group of experts and practitioners in the back channel and break out sessions on other topics. You'll have access to the chat transcripts and the content over at the WeAreMedia wiki. Amy Sample Ward has a great post about the WeAreMedia Webinar here. A few months ago YouTube announced that organizations that are in the YouTube Nonprofit Program would be able to use the overlay advertising feature to create donation links. They call the feature “Call To Action” and said that in their first test of this, Charity:Water raised $10,000 in one day. At the Nonprofit Technology Conference in March while I was conducting a session about online video distribution, I mentioned to Steve Grove and Ramya Ragahvan—who runs the YouTube Nonprofit Program—that while this feature is nice, it is really limiting. In addition to only appearing in a very limited way on the video, it only works on YouTube and not when you embed the video on other sites. While Charity:Water raised a lot of money, I politely suggested that maybe it had as much to do with the video being featured by YouTube (and therefore getting a large amount of traffic) as with the new functionality. But I knew they could make it much better. In front of the NTEN crowd I challenged them: “What would be really amazing would be to allow for outside links in the annotations features.” The annotations feature is available to all YouTube video makers and allows for the user to put an overlay box on any part of any video. YouTube allows links to go in these boxes, but only links to other YouTube videos or YouTube channel pages. Ramya said they started with the overlay because the technology already existed and that they would be working on extending the annotations function. I must admit that the cynic in me thought, “It’s really in YouTube’s interest to keep people on YouTube and not to allow them to leave.” In other words, I wasn’t holding my breath that they would create more ways that nonprofits could get people off of YouTube and on to engagement. I’ve been meaning to drop you a note, because I remember that you mentioned that you would love the ability to externally link from annotations. Happy to report that for nonprofits that are part of the YT Nonprofit Program, we have this functionality. All they’ll have to do, when creating an annotation, is click the “link” symbol and select “external link”. Then they’ll be able to link to external sites right from the annotation. Better still, these annotations should show up on embedded videos. Please feel free to share with nonprofits you work with. Make no mistake, this is a game-changer. If you still aren’t sure what all of this means, it means that nonprofit YouTube videos can have buttons built into the videos that say DONATE NOW or SIGN THE PETITION and these buttons will work—they will link to any site you point them to. You can even go back to all your old videos that are on YouTube and make your logo into a clickable link, add annotations to donate with a link, and otherwise make your video into a center of engagement. This is now, by far, the most important reason to be in the YouTube Nonprofit Program. People who watch videos on YouTube are very likely to do one thing when they are done…watch another video on YouTube. Not any more. With this new feature, YouTube can become a center for creating effective calls to action and engagement. Major props to Ramya and the entire YouTube team—you rock! Michael Hoffman is the CEO of See3 Communications and an expert in online video for nonprofits. Good Karma Calculator: How Much Has Been Raised for Charities on Facebook? How much has been raised on Facebook? asked Connor of Connor's Fundraising Blog. Great question, great blog too. That's where I found the link to the Karma Calculator which asks you to fill out a set of questions and lets you know the real charitable you. I'm Richard Branson. Oh, an now to answer the question. Connor, I don't know. Maybe some of my readers do. Here's what I do know. There isn't a comprehensive study that looks at total dollar amounts raised from all fundraising apps on Facebook. I've seen lots of posts about apps, but few on results. Allan Benamer had a bet with Causes founders last September but it required disclosure of total amounts raised on Causes. Allan thought it might be something like .25 cents per user (over 3 million users), but Causes never disclosed their numbers. The recent America's Giving Challenge from the Case Foundation reported on the Causes numbers - there were a total of 32,885 donors giving a total of $571,686 with an average of $17.48 per donor. The winner of the FB Causes challenge raised $93,000 on causes with an extraordinary effort and investment of time. This is a really cool idea - you can have special buttons made up that promote your cause - sort of like a physical widget that you can wear at face-to-face events or to distribute at conferences or events. 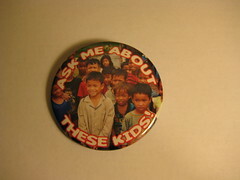 Buttons of Hope founder Michael Gibbons created this button for me to promote the Sharing Foundation's work. How do you creatively and effectively use promotional items to promote your organization or cause? The Kids in Cambodia Say Thank You Via Video Clip! Sharing Foundation's founder and president, Dr. Hendrie just forwarded me this 10 second video clip of the children in Roteang Orphanage. Thought I'd share it here. America's Giving Challenge Official Results: We Came In First! Thank You Everyone! 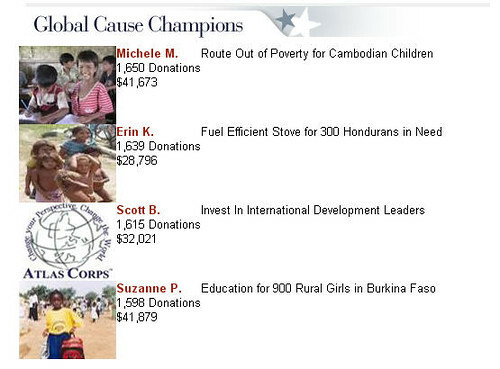 The final, official results have arrived for America's Giving Challenge and I'm happy say that we came in first place for global causes! This was truly a group effort - no one person could have done this alone. I want to thank each and everyone of you who donated, asked their friends and network to donate, spread the word through blogging it or other ways, and helped us cross the finish line in first place! Special thanks to Michele Martin! Adam Nicolson and Mark Grimes Send An Early Birthday Present! You're Not Going To Ask Us To Give You An Outhouse for Your Birthday? Why are these Cambodian Orphans Wearing Creative Commons T-Shirts? Why Pharoth Wearing a Foo Camp T Shirt? Don't Let Us Slip Out of the Top Four! Dave McClure - Only A Few Hours To Get Q2 Lunch With Dave! Help Gmail Cut Me Off for Spamming: I can't Email You A Thank You! Note: I've had this blog post in a draft for about a week and was reminded about it when I saw this post over at the NTEN blog asking Is Facebook A Bust or Is Obama's Model the Future? The amounts involved show that Case understands these endeavors are more social experiment than nonprofit sweepstakes. Sure, prizes of $50,000 matter for the winning organizations, as do the overall dollars raised (Idea League brought in $62,000, and Love Without Boundaries $94,000). 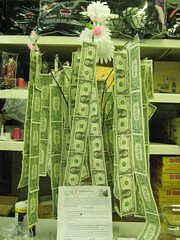 But the denominations of the donations remain small, and it's not clear that one-off contests will lead to more. Any fund-raising professional knows that most nonprofit organizations secure the bulk of their money from a relatively small number of large contributions, either from wealthy individuals or institutional sources. Those gifts demand personal cultivation, and an online nudge doesn't usually do it. "Philanthropy shouldn't be defined as a bunch of rich people writing checks," she told the New York Times. "Small amounts of money given by large numbers of individuals can be combined to do great things." Barack Obama's success at raising money online from thousands of small donors is the hoped-for model, though nonprofits recognize that political fund raising is different in some ways. I have agree with Case about small dollar amounts given by large numbers of individuals. But, it not necessarily anything new. I took the photo above in a Lowell, MA in a Cambodian grocery store when my kids and I were raising money for our America's Giving Challenge (unfortunately, not many of our friends there had either credit cards or email addresses - so they couldn't participate). The photo is a fundraiser for a local Budhist Temple which is trying to raise $100,000 for a building project (a large amount for that community) and money is coming from many small donations. This is a very common fundraising approach in immigrant communities, neighborhoods, and churches - where many people may contribute small amounts to help others. The charity that I was raising money for built its preschool building with $35,000 in quarters raised from school children in schools throughout Georgia, Florida, and South Carolina. So I wanted to open this discussion up to the NTEN community: will this "social experiment" of many-to-many and social networking campaigning prove a bust, or can the Obama model be replicated by other organizations? The America's Giving Challenge campaign that I just finished was my fifth person to person fundraising campaign using social media. I have raised over $100,000 for the Sharing Foundation (not counting any prize money) with and without contests. I have to say that I've had a good percentage of were repeat donors - people who donated to more than one cause. This is because I believe that it is important that the wired fundraiser serve as a bridge between the cause and the donors, building relationships, and asking again. I'm going to write up a case study or maybe make a screencast or something. Not sure yet. But Audrie noted in a comment that she would like to see a concise set of bullet points. Of course, that will be included, but I will also include some stories. Since I kept a diary and a number of you were following along, I'm curious what take aways you got as outside observers of this process? This would be helpful to me if you could share your observations. I'm too close to it right now. Seth Rosen has an analysis by the numbers. Rebecca Krause talked about motivations to give and participate. I was so busy online working my social media and social networks that I failed to notice the article from the New York Times about the America's Giving Challenge titled "Charities Vie for Prizes in Online Giving Experiment." Help! Google Cut off my ability to send out email via gmail! In the meantime, I have written on a blackboard 100 times: I will not spam for good. Thank You Everyone!!! We did it! I have not slept very much in the last two days and I am about to teach a social media workshop which I haven't prepared as well I as usually do because I spent the last few hours seeing this campaign to the end. We finished in the top 4 (as far as i can tell), with 1711 donors and over $40,000. I am in shock, awed, and really happy!! I owe this all to you, each and every one of you who helped this campaign go forward to success! Ruby saw this photo mashup that Dave McClure did and created a Facebook Group to help me! Love the update, "If Beth hasn't asked for money, you don't have a pulse." 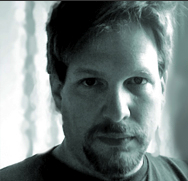 Chris Brogan Says $10 Before It is Too Late! 2 More Hours $10! Hurry .. Yesterday after flying for four hours and having serious anxiety about not seeing the numbers, I pitched the young lady sitting next to me, a Harvard student. We got off the plane, I opened up my laptop with wifi and she donated. I said thank you and then found this awesome post from Chris Brogan. Thank you! Dave McClure Is Pimping for Purpose - Hurry Only Three Hours Left! Three hours left to donate $10. Not convinced? Go read Dave McClure's challenge for the next 3 hours ... is great pimping for a purpose! OMG, We're in 5th Place With Only Hours To Go! It is not the $$ that count, but rather the number of donors-- here's the leader board, and you can follow this race, if you wish, to its finish tomorrow! We hope not a sad conclusion ! click on "give" and part with $10! Thanks for reading this = Beth has struggled mightily for weeks, but I wanted to make one last ditch effort- to get us out of < just > into the losers! Thanks loads for any help you can provide , and any friends you can involve. Thank you very much for your support! The direct link to donate $10 is here. Here's the deal. We need to be in the top four charities that get the most unique donors in order to win the $50,000 for the Sharing Foundation. 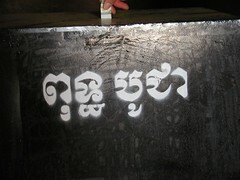 Essentially, I am asking YOU for $10 (USD) to help children in Cambodia. Donate here before the contest ends 1/31 at 3:00 PM EST. This has been a labor of love and I've had lots of support from my generous network (thank you). I am just one woman along with many other generous people who want to make a difference in the lives of Cambodian children. I'm amazed at the power of the Social Web to help my charity get this far, but please don't let the $50,000 slip away! We're so close. I can't bear the thought of letting those children down. The competition ends Jan. 31 3:00 PM EST. Please join the over 1,000 unselfish people who have donated to the Sharing Foundation and help make a difference in the lives of disadvantaged Cambodian children. Donate here. Nancy Schwartz Teaches Me How To Craft A Blog Appeal! One of the best learning opportunities in this campaign is to see how my awesome and talented colleagues who are ace marketers re-shape or improve my fundraising messaging. Take a look at how Nancy improved my original messaging. I hope she will leave me a comment with a critique that I can use for future reference. There's a lot to learn here. And, of course, I hope we $50,000 for the Sharing Foundation and the children in Cambodian. Thank you Teresa Crawford and NpTech Circuit Riders for Helping Us Swim Upstream! Circuit riders travel throughout regions of the United States and parts of Europe providing technology assistance to nonprofit organizations. As one organization providing such services defines the group: “Circuit Riders are a community of people with technology skills who help nonprofit organizations be more effective through the use of technology. We share a spirit of generosity towards each other and a commitment to social justice, a healthy environment and human dignity. We hold a fundamental belief that technology and all of its benefits must be made available to everyone” (MediaJumpStart, 2002). If you're curious, there's a whole chapter about it in this book "Geeks for Good." This is a wonderful community. 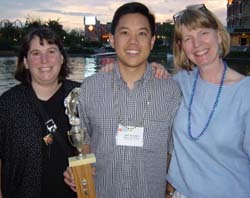 The photo above is of me, Cheryl Hanback, and Joel Remigio from 2002 when we won the "Swimming Upstream Award" for the diligent staff person who worked on the Riders Conference to make it a success. The trophy was a retro trout fishing trophy." I know about the fish because I schlepped the darn thing through airport security in Orlando and it sat on my desk for almost a year, from April 2002 until March 2003. A proud reminder of my 15 minutes of shared fame with Cheryl and Joel. Last night, Teresa Crawford, who one the "Dirk Award" that year posted this message to the Riders List. 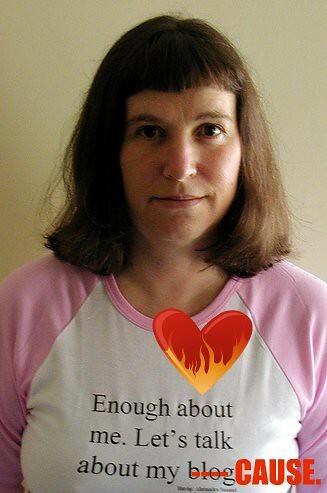 I am not sure if everyone is following the ups and downs of Beth Kanter's online fundraising for the Sharing Foundation in America's Giving Challenge. It has been quite a learning experience for me as she puts into practice all the how to's of online fundraising and documents it on her blog. This is exactly the kind of example we want to give to our clients. Beth has given alot to the Riders community over the years - online and offline mentoring, organizing the Day of Service, blogging about all our great work to help nonprofits make the most of technology. If anyone has been holding off on donating to the Sharing Foundation Campaign don't wait any longer. There is just 36 hours left to the end of the challenge and the campaign is in the lead by 16 donations. They have a good chance of securing 50,000 for the Sharing Foundation. For this small organization which is doing alot of good in Cambodia a prize like this means new children can benefit from their education programs, more young people can attend college and more families can move out of poverty. PS: Beth did not ask me to do this. I figured this was one more network to help put the Sharing Foundation over the top! I just want everyone to know that I plan to continue to share what I am learning and after this contest ends on January 31st - minus the ask for the money. Thank you for your support!